Return-line filters are used within a hydraulic system to remove particulate prior to being returned to the hydraulic fluid reservoir. As seals wear fragments and particulate from the external environment contaminate the hydraulic fluid, removing these particles extends the service life and reliability of system components such as hydraulic pumps and control valves. 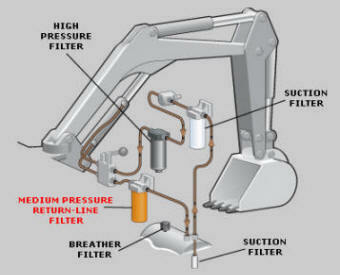 The excavator illustration shows locations where filtration might be utilized and is not to imply filtration is employed in all of those locations. The design of a hydraulic system will determine the type and location of the filter housings required. The PDF technical datasheet is hyperlinked to the applicable series name of each filter configuration. Click here if you require replacement Internormen filter elements for return line filters. The TEFB, TRW and TEF series return-line filters are mounted on top or within the hydraulic fluid reservoir with the outlet port directed into the reservoir. The TNRS and TRS series return-line filters are tank mounted with a suction connection for mobile hydraulic applications having at least two independent hydraulic circuits. The table below cross references part numbers with their Type Code, an alphanumeric description code which describes the characteristics of the filter element and is described within the filters technical datasheet.